I did something last night that I have not done in a few years. I cleaned out my medicine cabinet. I couldn’t find an aspirin, or my cough medicine for my sore throat Monday night at 1:30am. I was finding Flintstone vitamins in a junk drawer, Pepto Bismol in my makeup bag, Advil in my spice rack, and Neosporin in my sock drawer. I can’t blame everything leaving its appropriate place on my toddler son, most of the time stuff walks away because I am too lazy to put it back. 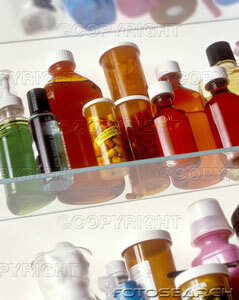 K, let me first say that I was N-E-V-E-R one of those people who ever snooped in someone else’s medicine cabinet. What a dumb idea, I mean, who does that??? I have no desire to see that my parent’s have hemorrhoid cream, or worse. I found enough weird crap when I was living at home as a kid, some things that would scare the bejeeezus out of a teenager! So, before I started hauling items in the trash bag, I looked at my medicine cabinet as a whole. What does its contents say about me? If someone was snooping in my stuff, would they laugh, cry, throw-up, deem me mentally ill?? 4. Perhaps I like to dabble in CSI Investigation (hence the magnifying glass and rubber glove). 5. I need to clean out expired items more often. Pretty much 80% of the contents went into the trash or flushed down the toilet. After I gathered the other items from around the house that rightfully belong in the medicine cabinet, I checked the expiration dates (I swear I did), put everything back and breathed a sigh of relief. So, if you want to snoop in my medicine cabinet, come on by. I, too, need to go through our medicine cabinets. Fortunately, we don’t have to go in there too often, but when we do, things are usually expired! Hope you’re all feeling better!